Before I moved into this house, I didn't cook a darn thing. So when I started cooking in the summer and preparing dinners every night, I had to look up things online like the difference between dicing and cubing. Now, I know a ton of cooking terms, I can substitute ingredients, and even make things from scratch. So over the past few months I've experimented with different ingredients and I would love to share one of them with you today. 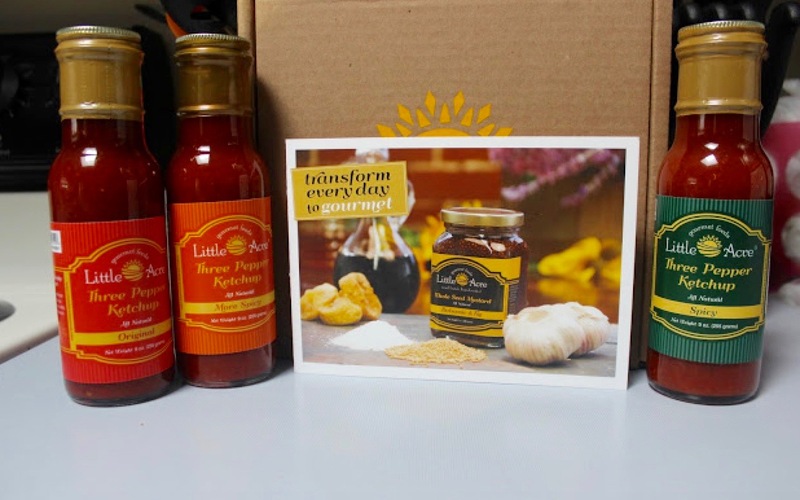 Little Acre Gourmet Foods is a line of gourmet condiments that are made from scratch in small batches and turn everyday food into something delicious! They offer whole seed mustards, gourmet ketchups, onion relish, and bourbon cranberry sauce. I really want to tell you about these gourmet ketchups! First of all you can use these as a ketchup, a cocktail sauce, or a salsa!! Their Spicy Ketchup Collection has three levels - Original, Spicy, and More Spicy. All of them have three different peppers in them rather than just one like you normally find in salsa. Each ketchup has jalapeno, red, and cayenne pepper inside. These are absolutely delicious and have so much flavor to them. I've used them in place of salsa so many times in the past couple of weeks when guests stopped by. Everyone loves the flavor and the fact that they can choose the level of spice they get. I also have used it to glaze chicken before baking in the oven. These ketchups add so much flavor and while they are spicy, it's not overpowering! I love supporting companies that take the time to put love and deliciousness in their products and Little Acre does just that! And one lucky winner is going to get the beautiful collection above from Little Acre! Ahhhh good luck caren! they are delish!